A real-life design example is used throughout the class to help you see the complete design process from inception to complete fabrication, assembly files and drawings. Design files are supplied along with the training manual (326 pages), and consist of a PCB outline and a simple set of schematics. The class is taught by well seasoned Altium Designer instructors who are familiar with both tool sets. The course is 3 full days. 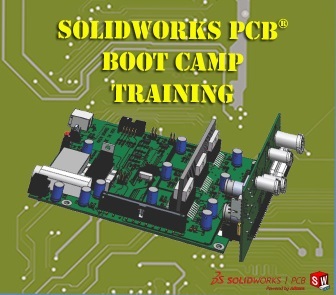 By conclusion of the third day, you will have experience with all the editors and many of the powerful features within SOLIDWORKS PCB. Most importantly, you will become well acquainted with the software and aware of its many capabilities and possibilities it brings to your organization.